I love a book that can live up to the hype, and this one really did. Which is saying quite a bit since the hype is huge for this one. I also can't believe this was a debut novel, which blows me away even more. 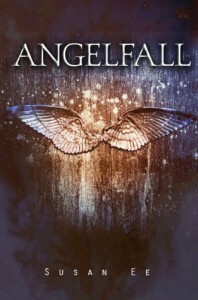 This is a YA romance dystopian book set in an apocalypse world where gods, angels, demons and other wicked creatures now dominate the earth. Humans are not prepared to fight for resistance, but between the human Penryn, the angel Raffe, and other great characters, leadership emerges to give the human world new hope. This story ended with a satisfying conclusion, but it left me wanting more, more and more. I am so glad book two, WORLD AFTER, is coming out in just a few more days.